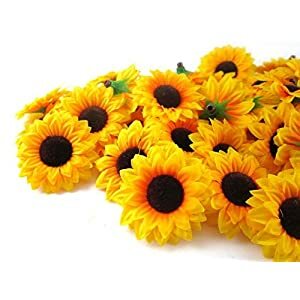 Beautiful sunflower bouquets,full bunches sunflowers, bright color perfect to brighten up any space,soft and comfortable feel,strong stiffness. 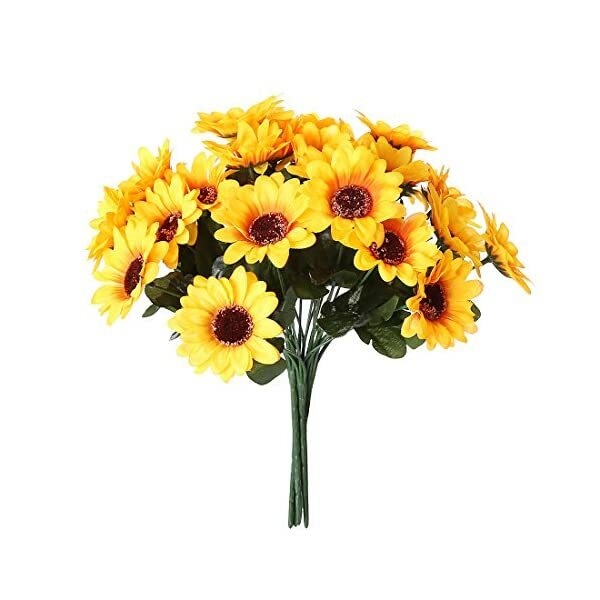 Well made and vibrantly colored, a classic touch to any floral arrangement.Perfect all year round decoration. Add more sunshine & Love to your love home, enjoy your colorful life. The artificial bracketplant flowers remain fresh and beautiful for years. 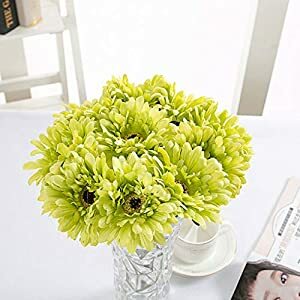 Best possible all year round decoration,add more sunshine & greenery in your love home,enjoy your life.Great for wedding, home, party, bar, coffee store, book store, garden, out of doors and festival decoration. 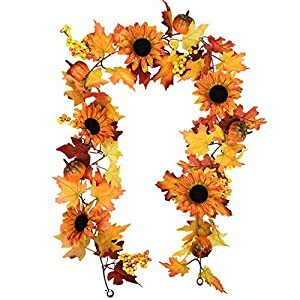 1.Please gently spread the object upon getting it, in case of falling the leaves and flowers. 2.There would be accumulated dust for those who put it in a spot for very long time.You’ll use the hair dryer with cold wind to take away the dust. 3.If it used to be seriously dirty,that you must sink it into salt water with high concentration for 10 minutes after which add neutral detergent after which rinse twice. 4.Do not wash it by hands. We recommend that you do not wish to wash it by hands and do not wash too ceaselessly. It is going to fade for those who wash it too ceaselessly. 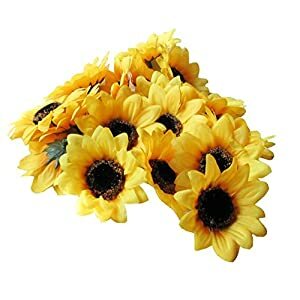 5.Please Do not put it under strong sunshine.You’d better to dry it by the natural wind. Material: silk with injection molding. The product is made of healthy and environmental materials.It is not easy to vanish or fall. 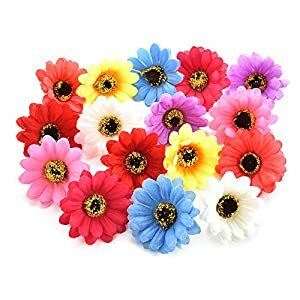 All flowers are look beautiful and vivid. 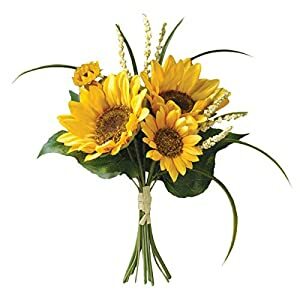 Beautiful sunflower bouquets,full bunches sunflowers, bright color Best possible to enliven any space,soft and comfortable feel,strong stiffness. 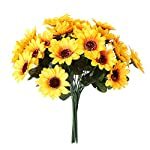 Well made and vibrantly colored, a classic touch to any floral arrangement.Best possible all year round decoration. 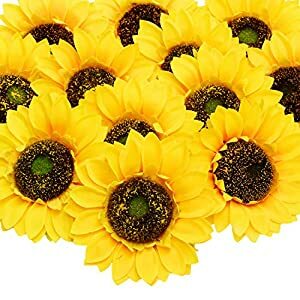 Add more sunshine & Love in your love home, enjoy your colorful life. 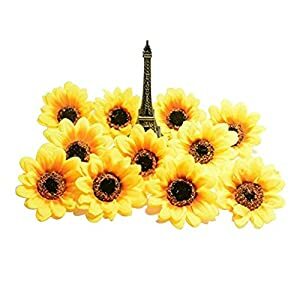 Sunflowers artificial flowers suit for weddings,party ,room ,garden,stages,parlours,bedrooms,parks,offices,dining rooms,countyards,stores and some other place that you wish to have to embellish and a wide variety of occasion’s decoration. 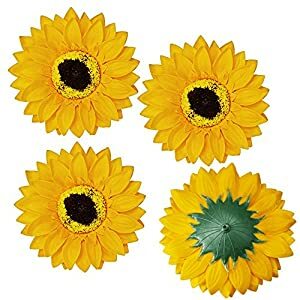 Attention: all the way through the long journey in your place, it’s inevitable that sunflowers may have been squeezed together. 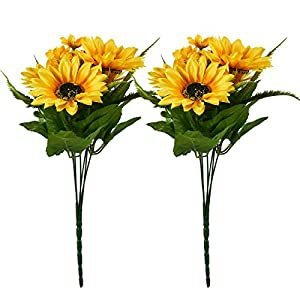 But, please donot worry, the sunflowers and the stems will also be adjustable. You’ll manually adjust them to a right place.